Though none had dared to speak about the risks involved in traveling through this area of the galaxy, everyone aboard the ship knew the threat looming over them as soon as they felt the engines shudder. A single shot from the dark vessel had taken out their propulsion systems, and with it their only hope of escape. Soon afterwards, the passenger heard voices. Not coming from the intercom, but from within their own bodies. The voices told them to prepare to join the Mind Collection, to become part of a greater whole, to give up everything they had to become more powerful than ever imagined. Though some resisted, all those aboard the vessel became part of the Mind Collection. And so it grows... spreading across a dark part of the Galaxy. In time, every sentient creature in the Galaxy will hear the voice of the Mind Collection and be called to take their place. Even those known as the Awesomenauts will be called, and they will make a fine addition indeed. 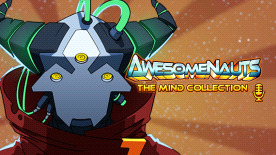 The Mind Collection Announcer can be activated from the character select menu or the in-game menu. Activating this Announcer will replace the default announcements made during regular gameplay with a whole new set.